I learnt about Glass Door through Ace of Clubs, the day centre for homeless people in Clapham where I’ve spent time over the last year. They regularly refer people to Glass Door, including those the other shelters won’t take. 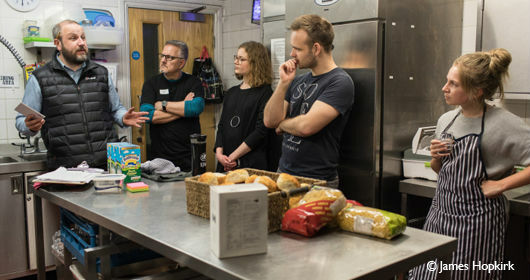 Night Shelter Manager Ben (left) briefs some of the volunteers at the start of the evening. Volunteers cook, serve the food and eat with the guests.